Bethel musher Pete Kaiser is the first musher into White Mountain, 77 miles from the Iditarod’s finish line in Nome. At 8:05 a.m. Tuesday, Kaiser pulled into the checkpoint, where all mushers must take an eight-hour layover. Defending champion Joar Leifseth Ulsom of Norway pulled in at 8:46 a.m. Both were racing with eight dogs. Fairbanks musher Jessie Royer is behind them at third in the standings. She left the Elim checkpoint at 4:46 a.m. Tuesday with 11 dogs, and was just over 20 miles from White Mountain as of 9 a.m.
As the first to White Mountain, Kaiser wins a $2,500 check and a print by Anchorage artist Marianne Wieland, race officials said. Farther back in the race, race rookie Niklas Wikstrand of Norway scratched in Kaltag at 12:42 a.m. Tuesday “in the best interest of his race team,” according to Iditarod officials. He was racing with 12 dogs at the time. Montana musher Brett Bruggeman scratched in Shaktoolik a few hours later at 7:20 a.m. with 11 dogs. Officials gave the same reason for his decision. They are the eighth, ninth and 10th mushers, respectively, to scratch in this year’s race, leaving 42 mushers on the trail. Five minutes separated the Iditarod’s top two mushers early Tuesday as the race headed to White Mountain. Bethel musher Pete Kaiser left the Elim checkpoint at 12:41 a.m., followed by defending champion Joar Leifseth Ulsom, who left at 12:46 a.m. Both were driving eight dogs. They were 123 miles from the finish line and 46 miles from White Mountain, where everyone must take an eight-hour layover. Kaiser reached Elim, 875 miles into the race, 50 minutes before Leifseth Ulsom. The Norwegian took a shorter rest there to narrow the gap. Kaiser was in Elim for 2 hours, 44 minutes, and Leifseth Ulsom spent 1:59 there. The only other musher to reach Elim as of 1:30 a.m. Tuesday was Jessie Royer of Fairbanks, who arrived at 12:47 a.m. She completed the 48-mile trip from Koyuk in 7 hours, 52 minutes. Kaiser made the run in 7:42 and Leifseth Ulsom did it in 7:32. The race is at running at nearly the same pace as last year at this point. A year ago, Leifseth Ulsom left Elim at 1:04 a.m. Tuesday morning and crossed the finish line as the Iditarod champion at 3 a.m. Wednesday morning. Iditarod leader Pete Kaiser of Bethel reached Elim at 9:57 p.m. Monday, 123 miles from the finish line in Nome. Defending champion Joar Leifseth Ulsom arrived 50 minutes later, at 10:47 p.m.
Kaiser made the 48-mile run from Koyuk to Elim in 7 hours and 42 minutes. According the race’s GPS tracker, defending champion Leifseth Ulsom did it in 7 hours and 32 minutes. Elim is 875 miles into the 1,000-mile race. White Mountain, the next official checkpoint, is 46 miles away. There, mushers must take an eight-hour layover before making the final 77-mile push to Nome. UNALAKLEET — One by one, mushers raced along the Bering Sea coast Monday, dashing from Shaktoolik to Koyuk and beyond in the 1,000-mile Iditarod Trail Sled Dog Race. 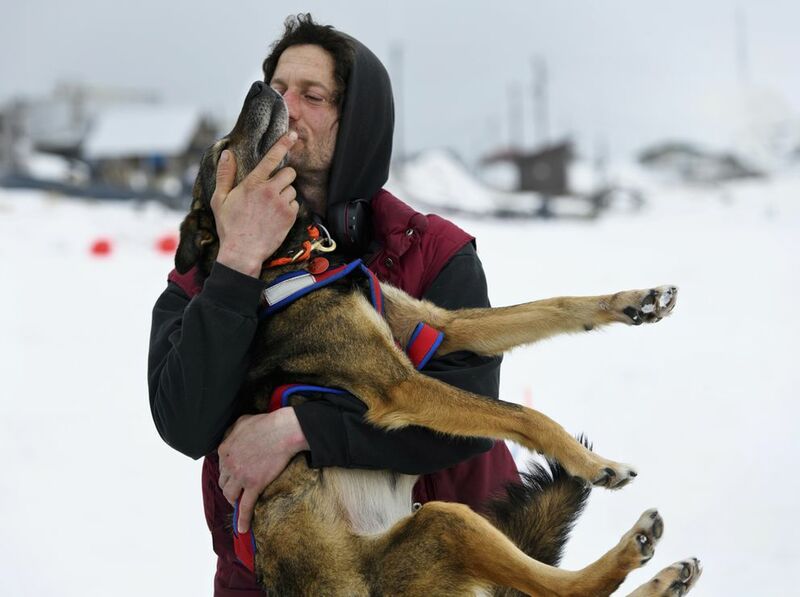 They all had to pass Girdwood musher Nicolas Petit, who was hours ahead of the competition before his team stalled on the sea ice after a dog fight broke out. With Petit stopped on the trail out of Shaktoolik early Monday morning, Bethel’s Pete Kaiser emerged as the new leader of this year’s Iditarod. Kaiser was the first to reach Koyuk, 171 miles away from the finish line. He spent about 5 hours and 20 minutes at the checkpoint before leaving for Elim, 48 miles away, on Monday afternoon. For the second year in a row, Petit lost his lead on the punishing Bering Sea coast, during a 50-mile section of trail that the Iditarod describes as a “bleak, flat, and deadly monotonous” between Shaktoolik and Koyuk. Last year, Petit lost the trail and his race lead in bad weather, and Joar Leifseth Ulsom surged ahead. Leifseth Ulsom went on to win the 2018 Iditarod and Petit placed second. This year, Petit called it quits. At 7 p.m. Monday, Petit turned around on the trail and scratched in Shaktoolik “in the best interest of his race team’s mental well-being,” according to Iditarod officials. His team was taken back to that checkpoint by snowmachine and trail sled. “Something about right here, huh?” he told the Iditarod Insider while he was still stuck on the sea ice. Petit said his dog team shot out of Shaktoolik “like a rocket” Sunday night. But then two of his dogs got into a fight on the trail. That brought the team to a standstill on the sea ice, about 14 miles out of Shaktoolik. Petit said that his dogs were eating and had no orthopedic issues. “It’s just a head thing,” he said. The Insider video showed the dogs resting on straw in the dark. On Monday morning in Unalakleet, mushers talked about the leader change-up. The race tracker is shown on a TV in the busy room where sourdough pancakes, bacon and eggs are served. Aniak musher Richie Diehl said that right before he went to bed, he saw that Kaiser had taken over the lead. A Kaiser victory would be huge for Southwest Alaska, Diehl said as he prepared to leave Unalakleet, the checkpoint about 90 miles before Koyuk. Four-time Iditarod champion Jeff King was also getting ready to leave the checkpoint. He described Kaiser as a meticulous, skilled and driven musher. Kaiser, 31, is a nine-time Iditarod finisher. He’s placed in the top 10 five times and has finished a career-best fifth three times, including last year. Kaiser is also a four-time champion of the Kuskokwim 300. For Petit, this is the third time in six years that he’s encountered trouble late in the race. In 2014, he was about 11 miles away from reaching Unalakleet when he and his team stalled. Petit eventually pressed his emergency locator button to officially withdraw from the race. Elsewhere on the trail, Willows musher Robert Redington and Lev Shvarts dropped out of the race. Redington called it quits in Kaltag and Shvarts scratched in Unalakleet. Each decided to quit “out of the best interest of his race team,” according to Iditarod officials. Seven mushers have scratched this year, which leaves 45 mushers on the trail. The race started March 3 in Willow. Daily News’ Marc Lester contributed reporting to this story.